Heimasíðan endurvakin! | Reviving the ARKIR blog! Hvað er að frétta? Heimasíða og fréttaveita ARKANNA hefur nú staðið óhreyfð í næstum ár! Bót og betrun er lofað og vonandi verður síðan virkari næsta haust og vetur. Þó hér hafi verið fátt um fréttir að undanförnu er ekki þar með sagt að ARKIRNAR hafi ekki stundað fagrar listir og bókverkagerð. Margskonar verkefni og sýningar eru í undirbúningi. Við sjáum hvað setur í þeim efnum, kynnum það síðar. Svo haldið sé áfram þar sem frá var horfið, eru hér fyrir neðan til upprifjunar myndir sem Kristín Þóra Guðbjartsdóttir tók af uppsetningu sýningarinnar ENDURBÓKUN í Safnahúsinu á Ísafirði haustið 2016. Any news from ARKIR? It was a bit shocking to find out that our blog has been silent for an almost a year! Of course we blame our busy lives, but hopefully we can post more news in the months to come, even old ones! 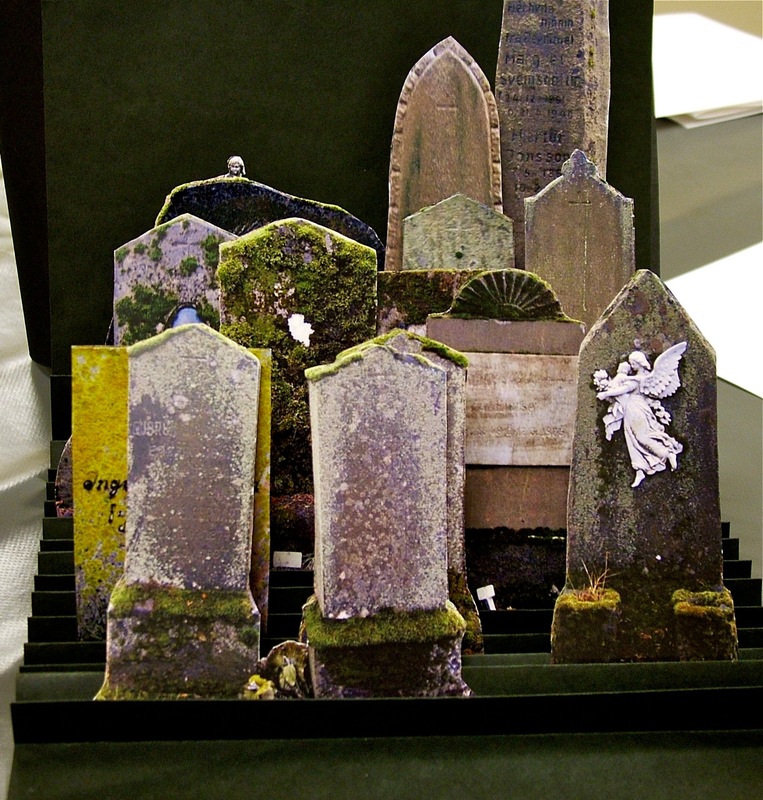 ARKIR are still busy working on book arts and multifarious visual arts, planning exhibitions and various projects. We’ll get back to that later! But just to pick up where we left off a year ago we bring some photos from our last exhibition in Iceland, in September-October 2016: RE-BOOK in “The Old Hospital” Cultural Centre in Ísafjörður. Photos by Kristín Þóra Guðbjartsdóttir. 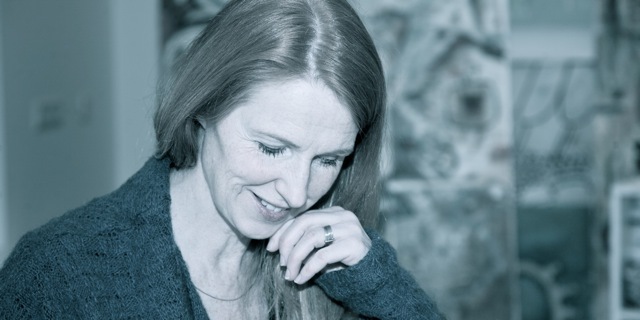 Um uppsetningu sýningarinnar á Ísafirði sáu þær Kristín Þóra, Inga og Svanborg. – – – Kristín Þóra, Inga and Svanborg worked on the display in Ísafjörður. Kæru gestir! – Dear guests! Það var vel mætt á opnun sýningarinnar „HEIMA“ í Norræna húsinu s.l. laugardag, 25. janúar 2014. Forstjóri Norræna hússins, Max Dager, bauð gesti velkomna; Hanne Matthiesen, fyrirliði CON-TEXT hópsins, sagði frá tilurð sýningarinnar og svo söng Svavar Knútur nokkur lög af alkunnu listfengi. Gaman, gaman! Kæru gestir: takk fyrir komuna! 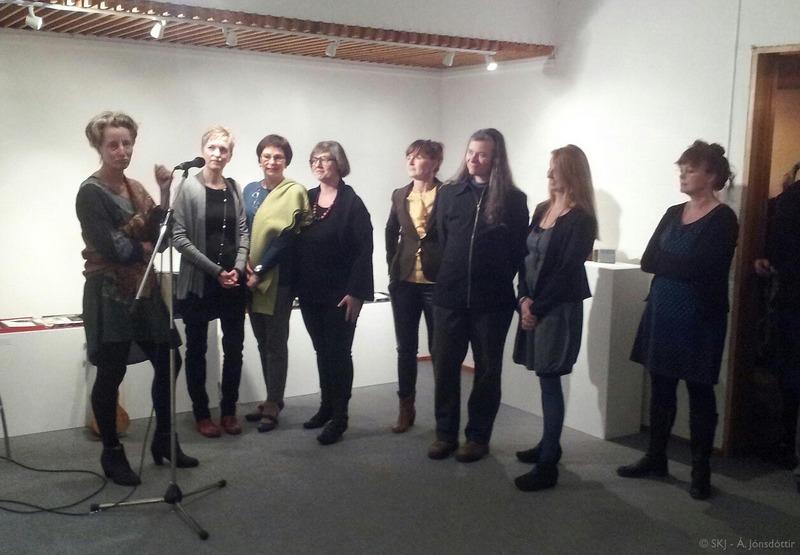 Last Saturday, January 25th, we celebrated the opening of our exhibition ‘HOME’ in the Nordic house. The director of the house, Max Dager, gave a short welcome speech; Hanne Matthiesen told us a bit about the idea behind the theme and the travelling exhibition; and Svavar Knútur sang some wonderful songs. We had a ball! Dear guests: Thank you for joing us! Hanne, Áslaug, Inga, Bryndís, Anna Snædís, Marianne, Sigurborg, Jóhanna M.
Þið sem komust ekki á opnunina getið hlustað á Svavar Knút af spilaranum hér fyrir neðan á meðan þið skoðið myndirnar. Þetta er ljúfur ástarsöngur þrátt fyrir dramatískan textann: „While the world burns“. Smellið á örina! For those of you who could not make it to the opening: Play one of Svavar Knútur’s songs on the player below while flicking through the photos. Despite the dramatic lyrics it’s a sweet lovesong: ‘While the world burns’. Click the arrow! Smellið á myndsafnið til að sjá stærri myndir. Click on the gallery to see larger photos. efni og aðferð: Blönduð tækni, endurunnar gamlar bækur með resin og býflugnavaxi, hefðbundin bókagerð. 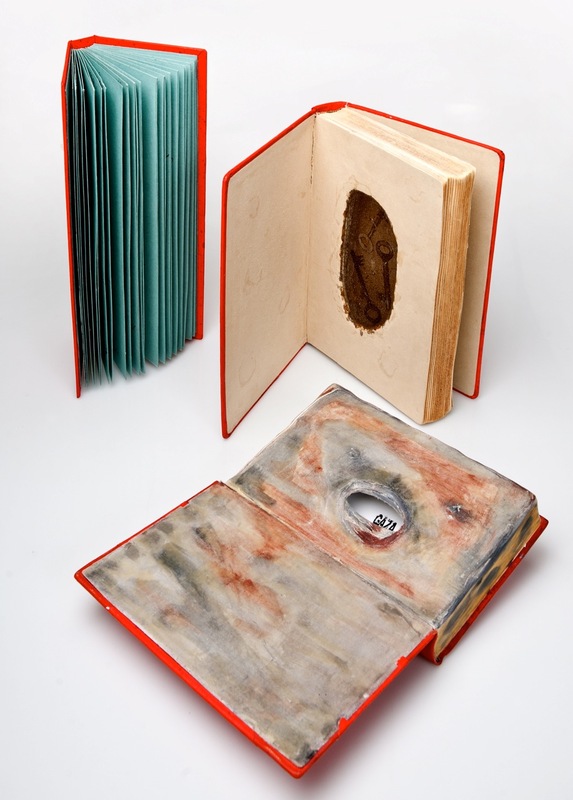 materials and method: Mixed media, recycled books with resin and beeswax, traditional bookmaking. 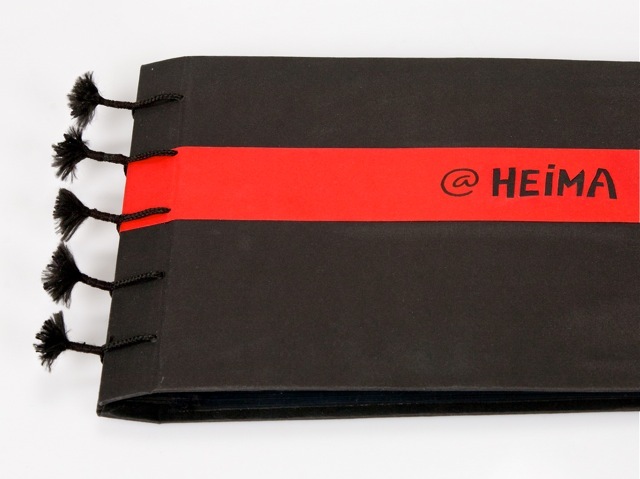 In the exhibition Home, Jóhanna Margrét exhibits three books in bright red covers. Although they differ in form and sizes, together the three books form a whole. Jóhanna explains the concept:“My first idea was to get friends and family to write down all the addresses of the places they have lived at since they were born and to this day. Everyone was very keen to do it and started to review their past and wanted to be very accurate, not forgetting a single address. Through those lists many stories popped up which included almost invariably good and warm memories. Then I started thinking about how very different fortunes are, depending on where we are born in the world. Jóhanna stundaði nám í Kent Institute of Art and Design, England, Glasgow school of art, The Icelandic College of Arts and Crafts og lauk auk þess námi í kennsluréttindum frá Háskóla Íslands. Hún kennir listgreinar við framhaldsskóla og vinnur að bókverkum sem hún hefur sýnt á samsýningum hérlendis og erlendis. Hún býr og starfar á Íslandi. 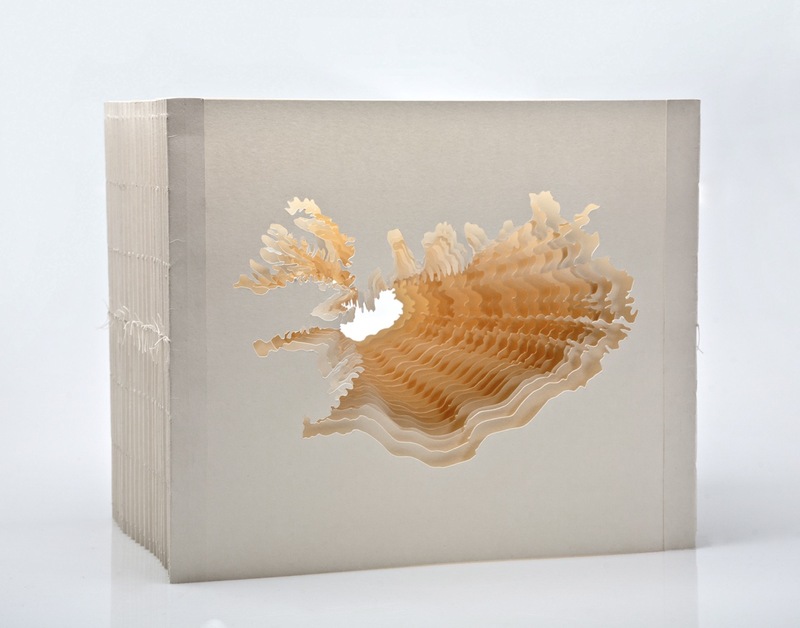 Jóhanna studied art at Kent Institute of Art and Design, England, Glasgow school of art, The Icelandic College of Arts and Crafts and finished teaching ecucation at the University of Iceland. She lives and works in Iceland, teaches arts, makes artbooks and takes part in group exhibitions in Iceland and abroad. Næstu vikur kynnum við nokkur íslensku verkanna á sýningunni hem : HJEM : koti : heim : heima : angerlarsimaffik í Silkeborg Bad. Fleiri færslur bætast við á næstu vikum. 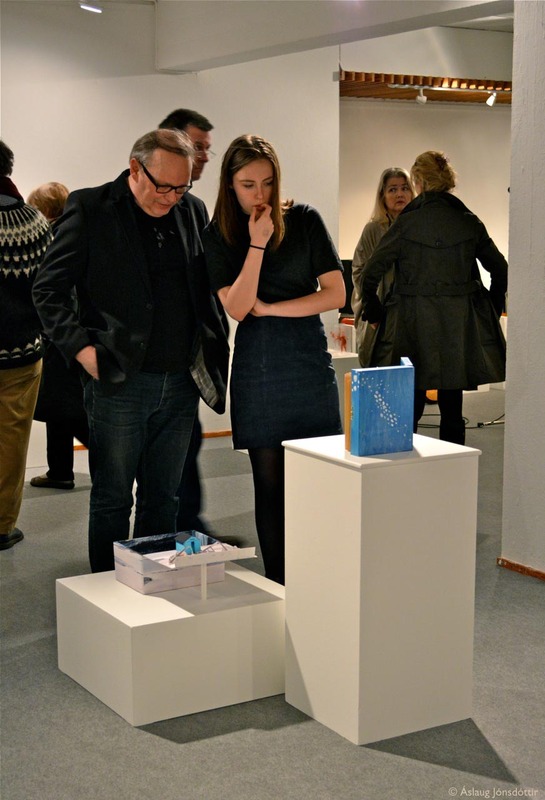 In the weeks to come we will introduce some of the works by the Icelandic artist in the exhibition hem : HJEM : koti : heim : heima : angerlarsimaffik in Silkeborg Bad. This is the first post. © ljósmyndir / photos: Áslaug Jónsdóttir og Lilja Matthíasdóttir. stærð: 19 x 25,5 cm. size: 19 x 25,5 cm. Sigurborg er listmálari, bókverkakona og grafískur hönnuður. Hún stundaði nám hjá Hans Chr. Højer í Kaupmannahöfn og síðar í Skolen for Brugskunst, nytjalistaháskólanum í Kaupmannahöfn. Hún hefur tekið þátt í námskeiðum í Bandaríkjunum, Japan og á Íslandi. Hún býr í Reykjavík og er með vinnustofu á Grensásvegi 12A. 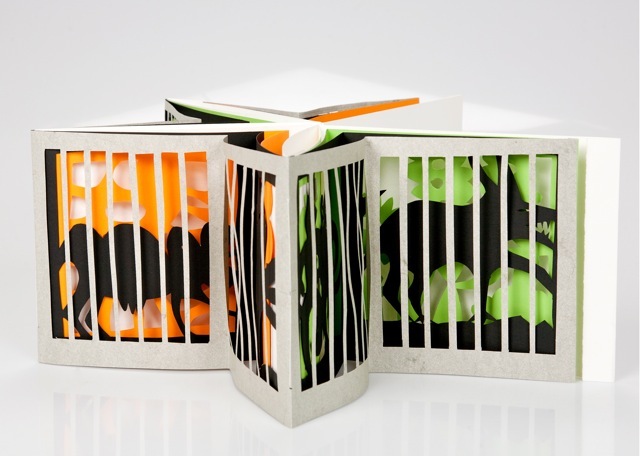 Sigurborg is a painter, book artist and graphic designer. She studied art with artist Hans Chr. Højer and at Denmark’s School of Design, Copenhagen, Denmark. She has attended art courses in USA, Japan and Iceland. 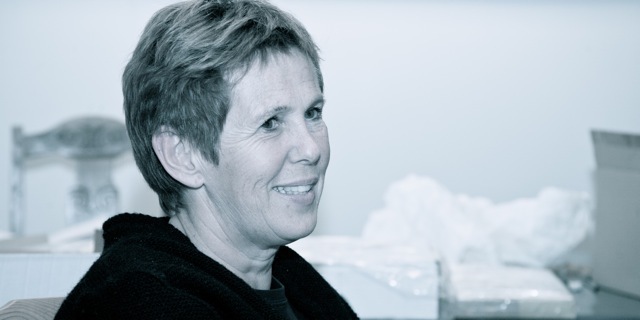 She lives in Reykjavík and has a studio at Grensásvegur in Reykjavik.